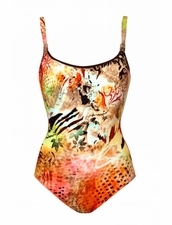 Designer one piece swimsuit from our designers are their amazing imagination and creativity. These range from classic cuts from Karla Colletto to exotic designs from Beach Bunny. Are you looking for one pieces with bold, single colors or wild and vibrant? Seeking one pieces with jewelry or without? If you're looking for one pieces, no matter what style you're interested in, you will find them here.